Onlookers crowded on the sidewalks of South Street Saturday afternoon to watch as several hundred demonstrators marched chanting and waving signs. For the fifth year in a row, marijuana smokers and non-smokers alike rallied in cities across the globe for the Global Cannabis March in support of the reformation of marijuana laws. Organizers of the event said more than 250 cities worldwide were involved this year. The demonstrations in the U.S. were put together by the National Organization for the Reform of Marijuana Laws, a non-profit organization. The march was a call for the end of “marijuana prohibition,” as Philadelphia demonstrators put it. “NORML supports the legalization of marijuana for medical, recreational and industrial use. Our goals are to legalize it in any capacity we can,” said Derek Rosenzweig, co-chairman of Philadelphia’s chapter of NORML. Currently, the organization has its sights set on the legalization of medical marijuana in Pennsylvania. “Right now, our main goal is to make sure that patients have access to marijuana and won’t go to jail for it,” said Rosenzweig. Rosenzweig became involved with the organization after his father was diagnosed with a disease that, according to proponents of medical marijuana, can be treated with the use of marijuana. During the march, many demonstrators carried signs depicting a pill bottle marked “Rx Marijuana.” Leaders called on people to write to their representatives in support of the medical marijuana bill that is currently in the state legislature. The bill to legalize medical marijuana was introduced to the state legislature by Rep. Mark Cohen and NORML on April 29. It’s the first bill of its kind in Pennsylvania. Modeled after New Jersey’s Compassionate Medical Marijuana Act, the Barry Busch Compassionate Use Medical Marijuana Act would allow authorized patients in Pennsylvania to grow, buy and possess marijuana from state-approved compassion centers for therapeutic purposes. Adam Weiss has been working to build support for New Jersey’s medical marijuana bill as a member of the Coalition for Medical Marijuana, and has helped to see the bill through both houses of the state legislature. Approval from the General Assembly and Gov. Jon Corzine are all that stand in the way of New Jersey becoming the 14th state to legalize medical marijuana. 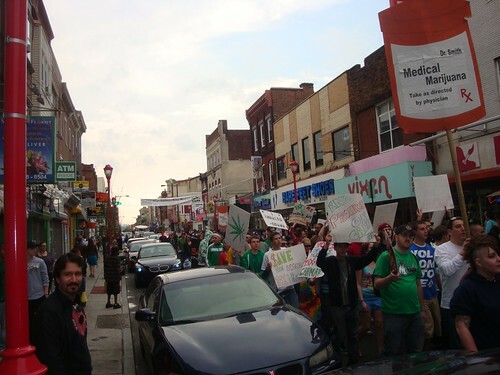 Still, many of the demonstrators called for a complete legalization of marijuana. One participant, who identified himself as “Scruff” but said his real name was Jeff, said the drug should be legalized simply because he uses it. Then after a long pause, he elaborated on his views. Tim McCullough can be reached at tim.mccullough@temple.edu. Keep up the good fight! Glad to hear there was a good turnout.